Well just trying to squeeze in a few minutes in a busy schedule that includes a full-time j-o-b to work on this site. I've decided to start putting up articles that don't adhere so strictly to the "theme" of this website and just rather, ramble on about subjects that are important to me (but still have a relationship to this site, of course). So here is the first of these articles, which is unusual because it describes a first-hand experience that we had, something which I rarely do, as I prefer to keep my private life fairly separate from this site. Also – COMMENTS are going up! So if you have recently (or not so recently) left a comment here on this site, it should be going up shortly (ie. in the next few weeks, not days!). This site doesn't have automatic commenting (as far as I'm aware of), so I have to put up all comments manually, hence it takes me some time. Also, if you left a comment on one page and it doesn't appear there, I might have put it up on a different page, because I haven't set up a system (yet) to indicate to me which page each comment is coming from. So if your comment doesn't appear on the page you left it on, I might have placed it onto a related article instead. Sorry, technical blips from someone who is NOT a techie and is most definitely NOT a web designer! So now without any further ado, on to the latest articles and posts. Well, this is a slight departure from the usual themes that I like to touch upon in this website. But I thought it would be interesting to describe a first-hand experience that we had, a few years ago. As spiritual seekers, we often try out new spiritual fads, new currents of thinking, non-conventional religious models and, why not, alternative ways of living. So it might occasionally happen, that we get the opportunity to set foot inside a real, live sect, and catch a glimpse of what everyday life is like in these hermetically sealed environments. I'm amazed that anyone could just accept sect doctrine as if it were scripture and believe in it with all their heart and that anything anyone else says is wrong or evil. Especially people born and raised outside this community (in the "real, normal" world). I find it hard to believe that they could ever accept what the doctrine teaches as the one and only truth, and reject everything they had ever been taught in their pre-sect life. But I'll tell you later what doctrines and dogmas this group of people teaches them. First, our visit! I'd like to invite you to take the time to browse through a few articles on my site. You can read about the origin of the name of the site, The Seas Of Mintaka, here in this article on The Story of The Seas Of Mintaka. 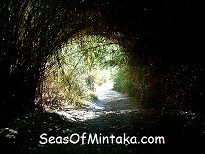 Find the latest articles and blog posts here at The Seas Of Mintaka Site Blog. And you can read up on what I personally believe and stand for in this article on What I Defend. Or you can click here to go to the Seas Of Mintaka Home Page. Wishing you all the best in your life and a great day today! If you like this e-zine, please do a friend and me a big favour and forward it to your friend. If a friend DID forward this to you and if you like what you read, please subscribe by visiting the site at The Seas Of Mintaka and signing up in the "Subscribe" box on the right-hand column.